Democrat strength in Portland is clearly visible in this map. Source of data: Oregon Secretary of State. Source of map: Metro RLIS. 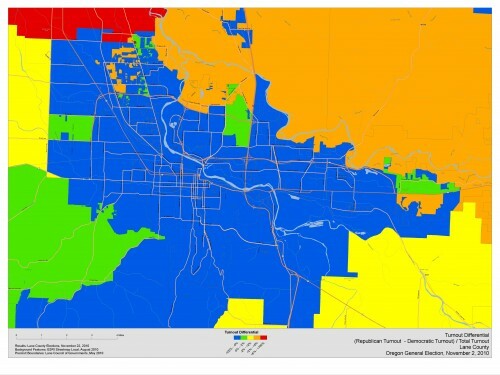 Democratic turnout was strongest in the City of Portland. The old Democratic stronghold of eastern Clackamas, in the mountains, is still visible. However, there are not very many people in those parts. 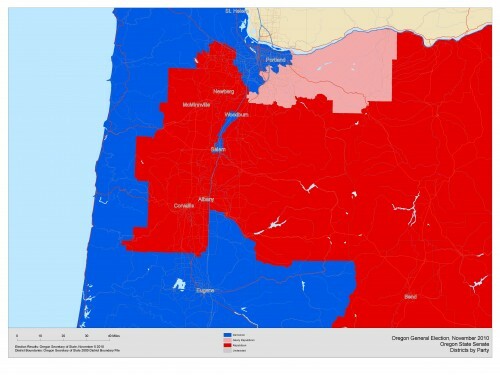 The Democrat stronghold of Eugene-Springfield is clearly visible in this map. Source of data: Oregon Secretary of State. 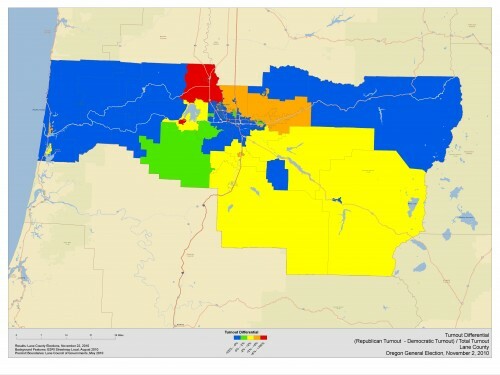 Source of map: Lane Council of Governments. The partisan Democrat strength in the cities and the old strength in the moutains is visible. Kitzhaber’s strength in Portland and Dudley’s strength in the suburbs is clearly seen. 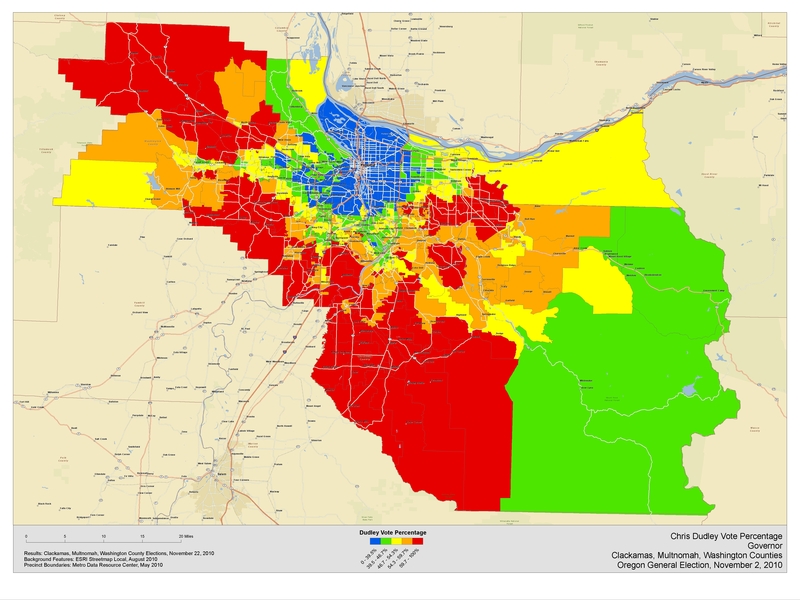 Source of data: Clackamas County Elections, Multnomah County Elections, and Washington County Elections. Source of map: Metro RLIS. 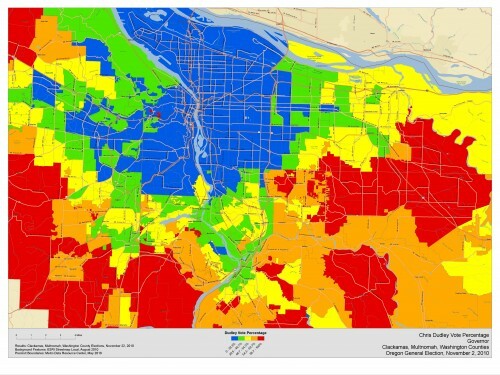 Kitzhaber’s strength in Portland and Dudley’s strength in the suburbs and rural areas is clearly visible in this map. This is the typical Democratic/Republican split one seens in almost every Oregon election. Kitzhaber was strongest in central Eugene and Dudley relatively stronger in the outlying areas. 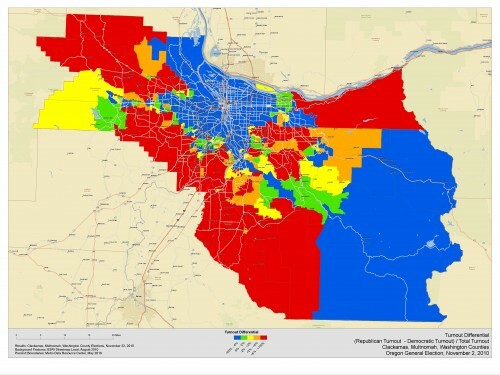 It is interesting how far Springfield has moved to the Republican side in the last decade. Source of data: Lane County Elections. 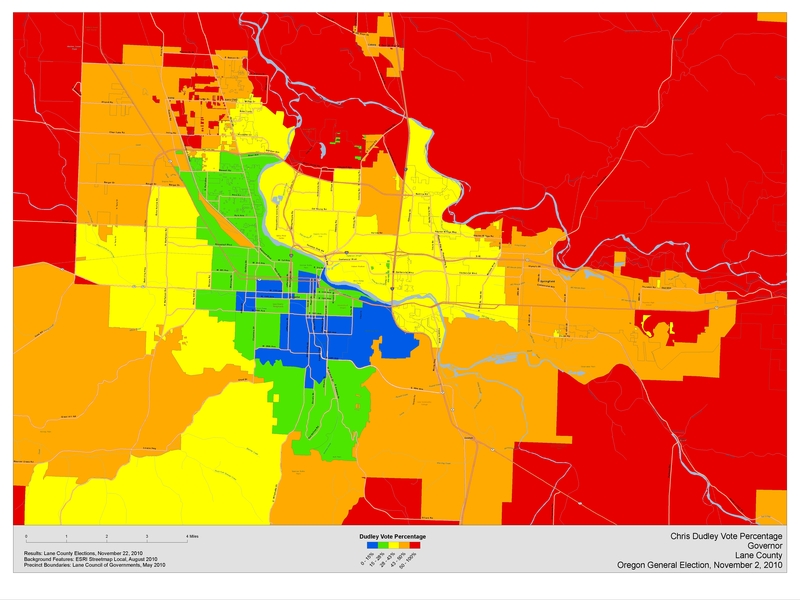 Source of map: Lane Council of Governments. 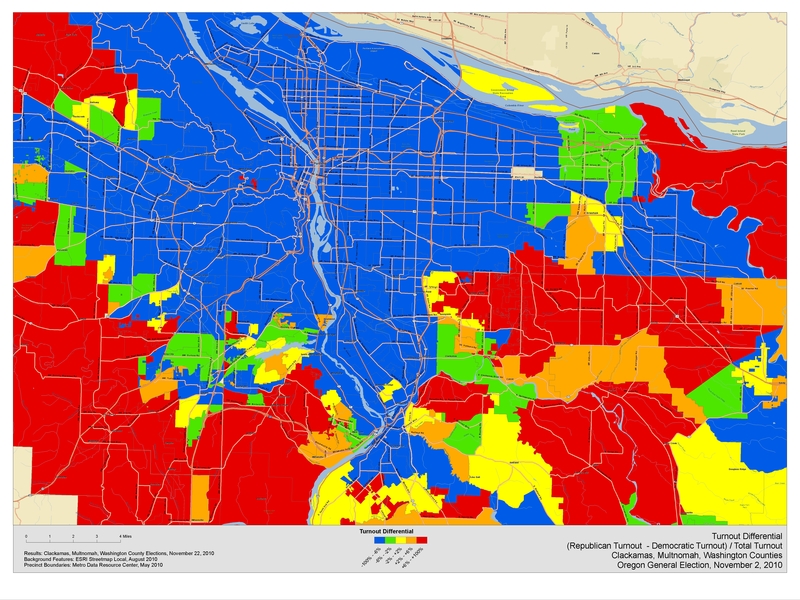 The rural areas of Lane County were clearly more Republican than the core. Republicans only picked up the two districts in the eastern Tri-County Metro area. Source of data and map: Oregon Secretary of State. 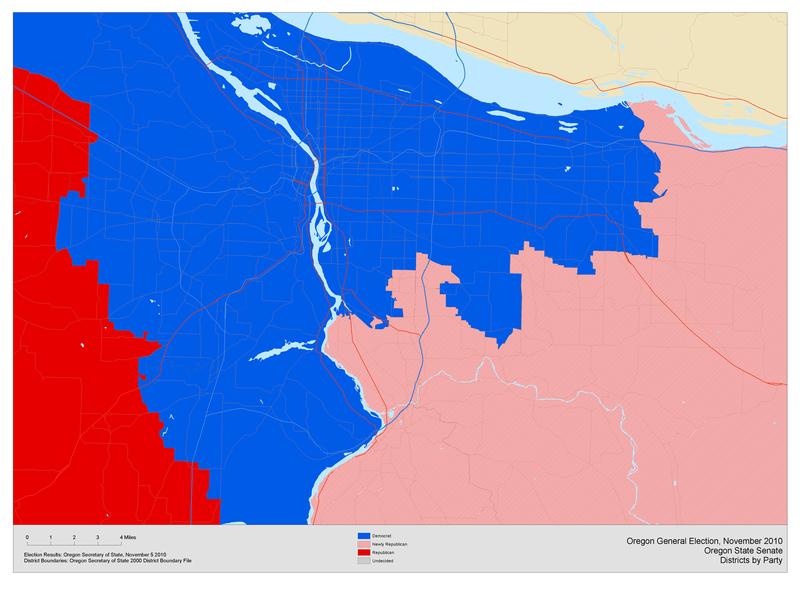 The Republican picked up the two neighboring senate districts to the southeast and east of Portland. Both of the house districts that make of Senate District 26 changed hands. 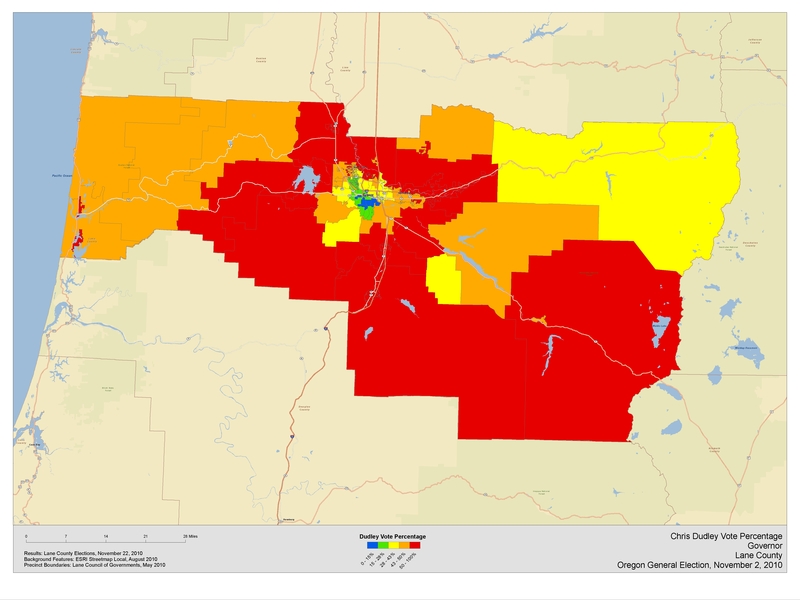 The house districts that make up Senate District 20 remained split between the two major parties.